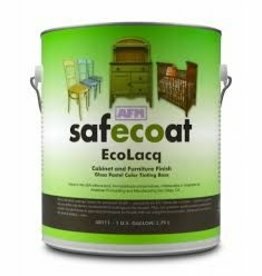 Since 1983, AFM Safecoat is the leading provider of environmentally responsible, sustainable and non-polluting paints, stains, wood finishes, sealers and related green building products. Their mission is "helping people live healthier lives through safer building products. To continually develop superior quality paint and building solutions with low or no toxicity." Founded in 1983, AFM grew out of its relationship with the medical industry. Safecoat products were developed in consultation with environmental medicine physicians and their patients, so as not to irritate or be a problem for people with allergies or chemical sensitivities, and not to cause indoor air quality problems. AFM started by working with doctors to create safer products for those particularly susceptible to offgassing. It all started with Safe Seal, designed to create a membrane over building products that offgas. Due it its success, work began to develop all sorts of safer materials. Even today, doctors will actually write prescriptions for AFM products to their allergy and chemically sensitive patients, and AFM is well known to physicians who practice environmental medicine. One of the reasons AFM products work so well for individuals who are sick or who suffer from allergies is because they do not cause or contribute to indoor air pollution. This clear, high-gloss, water-based replacement for high-solvent content lacquer is hard and durable, with superior resistance to stains, marring and fingerprint marks. This low-odor, water-based semi gloss or satin clear sealer works on porous interior tile or masonry surfaces where oil and water repellency are desired. This multi-use, clear gloss sealer is formulated to provide mar resistance to both low- and high-porosity surfaces. SafeCoat AcriGlaze is a non-toxic, clear, topical sealer with a Matte or Gloss finish that can be used on indoor unfinished masonry, brick, plaster, wood, and paneling applications. It also works great over milk paint or clay paint. Safecoat EcoLacq is a pigmented, hard and durable high gloss, water-based replacement for high solvent content lacquer. This clear, moisture-resistant sealer works for porous tile grout and other cement surfaces. 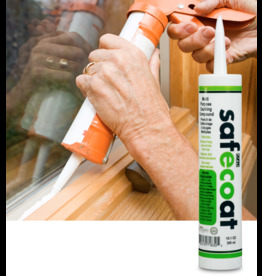 This non-toxic, water-based elastic emulsion type of caulking compound is designed to replace oil caulk and putty for windows, cracks and general maintenance.